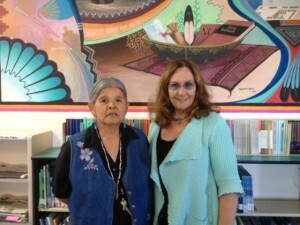 Tribal Libraries Program Staff: Jeannie Whitehorse, left, & Alana McGrattan. The legislation to create the Native American Libraries Program was introduced by former Senator Leonard Tsosie in the 1994 legislative session. We are planning a celebration of the program in 2015 which would be 20 years of the program’s actual presence within the New Mexico State Library. Since starting as Tribal Libraries Program Coordinator in April of last year, I have visited every Tribal Library (nineteen) and three Navajo chapter house meetings for Northern, Eastern and Ft. Defiance agencies. I am inspired by the hard working Library Directors who have kept their programs alive and thriving in spite of many challenges. We have four developing libraries that have moved to full library status this year: P’oe Tsawa Community Library at Ohkay Owingeh Pueblo, Pueblo de Cochiti Library, Pueblo de San Ildefonso Library and Pueblo of San Felipe Library. Credit for support from NMSL needs to be given to Eleanor Bernau, Continuing Education Coordinator (recently retired) and Patricia Moore, Technology Consultant who have worked with the Tribal Libraries in the absence of a TLP Coordinator. I was able to travel with Jeannie Whitehorse from our Crownpoint Outreach Center for Summer Reading Programs and Digital Literacy training. Her ability to communicate smoothly in Navajo and English and her long-term relationships in the communities is crucial to the strength of the TLP Program on the Navajo Reservation. Some of the students in the digital literacy classes still do not have access to running water in their homes. Although connectivity is still an issue particularly on the Navajo Reservation significant progress is being made. For more information about the Tribal Libraries Program contact Alana McGrattan at Alana.mcgrattan@state.nm.us.